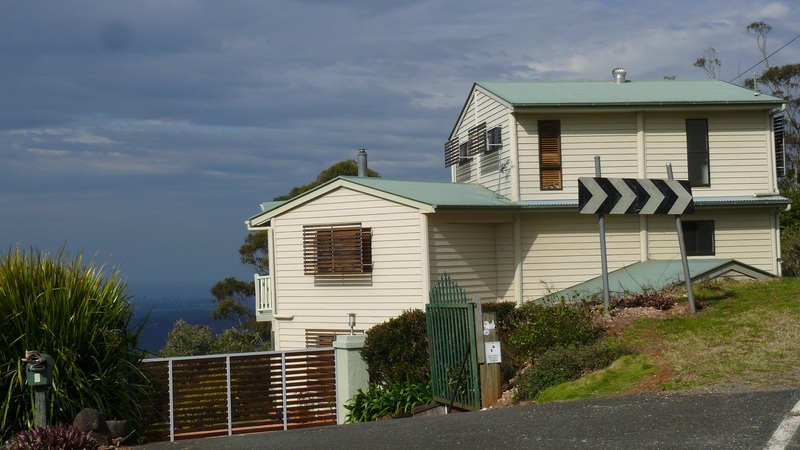 Tamborine Mountain | Frank & Donnis Travel Blog "the more we see the more there is to see"
This last week or more I have been reviewing our travels since 2005. I sort of went down memory lane. This prompted me to go back over the pages and posts of this blog to see where we were and what we were doing at this time of year. 2005. We attended a motorhome rally at the base of the Ross River Dam in Townsville and met with the occupants of 200 other motorhomes and did all the things people do at rallies. It was here that we met visiting NZ couple Jerry and Sue P who had bought a motorhome and had just kicked off their round Australia trip. We caught up with J & S at Coolangatta a few weeks ago and wrote about it at post 324 dated 14/7/13. 2006. There is no post for August 2006.Hmmm! Mid-winter, is an ideal time in the tropics to get out and about bush camping. I am surprised we did not have an entry for August. 2007. We attended the Gemfest at Rubyvale, Anakie and Sapphire in the dry and dusty back country over the Great Dividing Range behind Mackay. We camped in our then motorhome, a converted Toyota Coaster bus, on an infrequently used Sapphire mining lease owned by a friend. Beside our motorhome were two excavations which had been dug by hand in the search for Sapphire. 2008. On-line friends, Cuppa and Mrs T came to visit for a week while on their 18 month around Australia trip. We bush camped at O’Connell River, midway between the city of Mackay and the country town of Proserpine. 2009. Mid-winter in the tropics usually means long dry spells and the grass begins to brown off and become dry and crackly. We spent most of the month at home working or painting the house. 2010. I worked my last week and had a dinner with all the staff and said my goodbye’s and felt absolutely wooden. (I had handed in my notice of retirement exactly one month previously) I was severing a life where I was paid every week and was now about to step out and face an unknown financial future. 2011. Strange how the fickle finger of fate dishes out twists and turns in our life. Almost 12 months had gone by since we left our home in Airlie Beach and our stopover at Finch Hatton before ascending the pass through the Great Dividing Range to begin our adventure on the other side of the mountains. We found ourselves back in Finch Hatton while Donnis worked as a nurse and I worked on the Australian Census. So here we were back at our starting point and making plans to leave again. 2012. This week 12 months ago we were in the Eurobodalla Shire on the south coast of New South Wales. It was cold overnight but the days were sunny and if you could find a spot out of the chilly wind, quite warm. We were at a favourite freedom camp site at Potato Point. 2013. 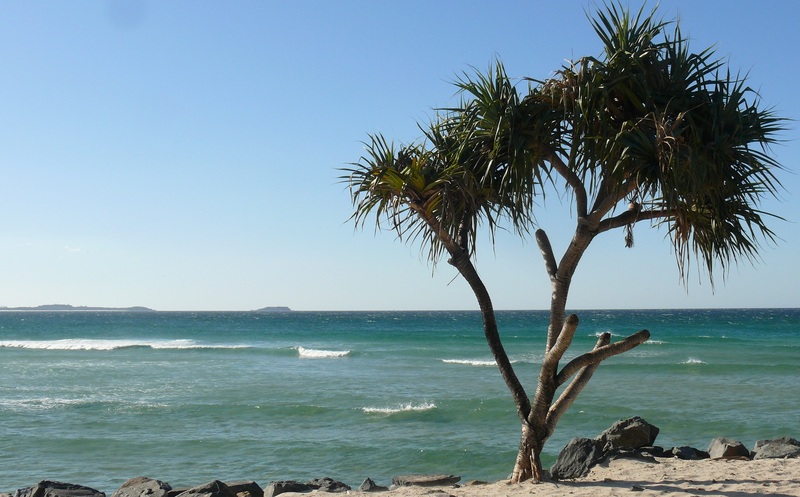 Here we are, housesitting at Fairfield in Queensland and exploring around Brisbane and the Gold coast. Donnis had a small lump removed from her shoulder this morning. The tissues have been sent to a lab for analysis and the results should be back in a few days. In the afternoon, long term friend Greg T with two of his sons arrived from Guyra. 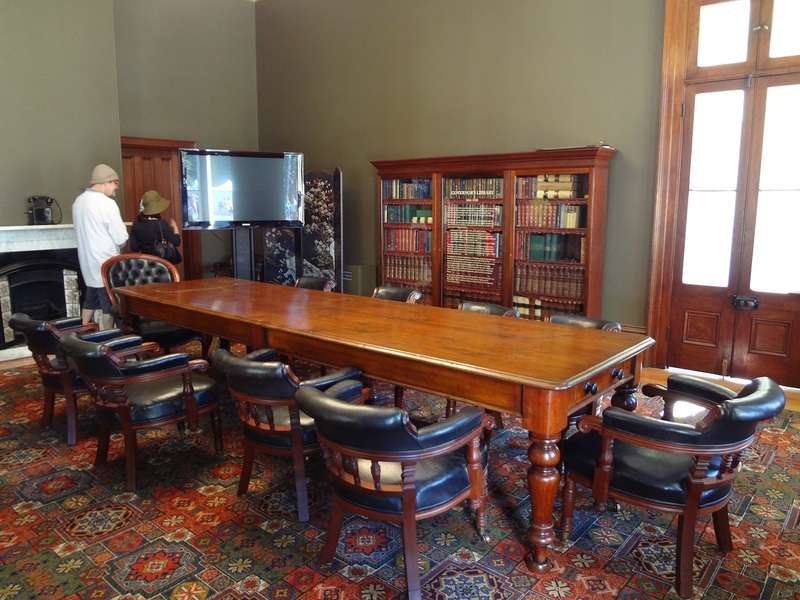 Regular readers will recall I house sat in Guyra from November 2012 until end of Feb this year. By coincidence Greg, wife Linda their four sons and one daughter lived across the street. We had a big pasta dinner of spaghetti bolognaise with sourdough rye bread lathered with garlic butter. Greg brought a home baked date and fruit loaf and we had fruit and ice cream for dessert. Yummo. It was the first time we have eaten bread, cake, ice cream and pasta for a couple of months. My body did not like all those carbs as I weighed a kilo heavier when I went to bed. Greg, Ian and Justin stayed another night. Greg and sons followed us onto the motorway. We headed to Kingscliff in NSW near the Queensland border while Greg continued to Grafton northern NSW then headed over the mountain range to their home in Guyra. Donnis and I went to an Over 50’s Lifestyle Resort to view the facilities and a couple of villas which are for sale. http://www.noblelakeside.com.au/k_welcome.htm The resort is built around a small lake but large enough for a small catamaran to spend many happy hours sailing around. Hmmm! My imagination was getting a bit ahead of our visit. The facilities are quite nice, the grounds tidy and the villa prices reasonable, the two villas we saw were comfortable and a good size but just did not grab my attention with a wow factor. The resort is only a couple of Klms from the surf but on the day of our visit a southerly change, including strong winds came roaring along the coast, dropping the temperature and winds so strong we had trouble standing upright and the wind blown sand stung our legs. 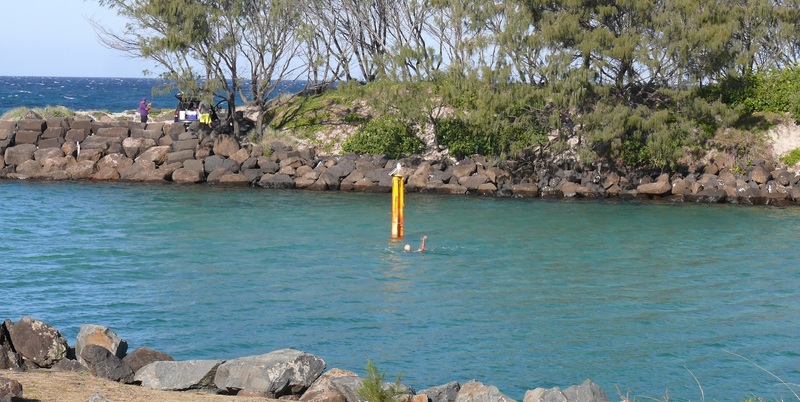 VMR (Volunteer Marine Rescue) Station on the Cudgen Creek Point at Kingscliff Beach, NSW. 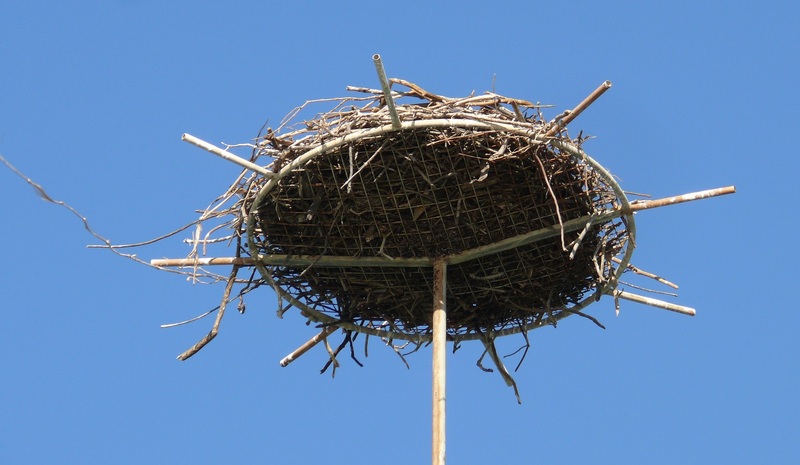 Osprey nest atop a pole beside the VMR Station at Kingscliff Beach. I thought this man was in trouble with his hand raised for help. I immediately pulled off my Clark Kent clothes and before I could perform a Superman rescue he rolled over and completed a flopping swim to the shore. What did he do next? He did a flopping swimming style back to the other side and included a few more raised hands. When he reached the other side he turned around and came back. Pelicans at Cudgen Creek near Kingscliff NSW. We are seeing more of these lizards lately. 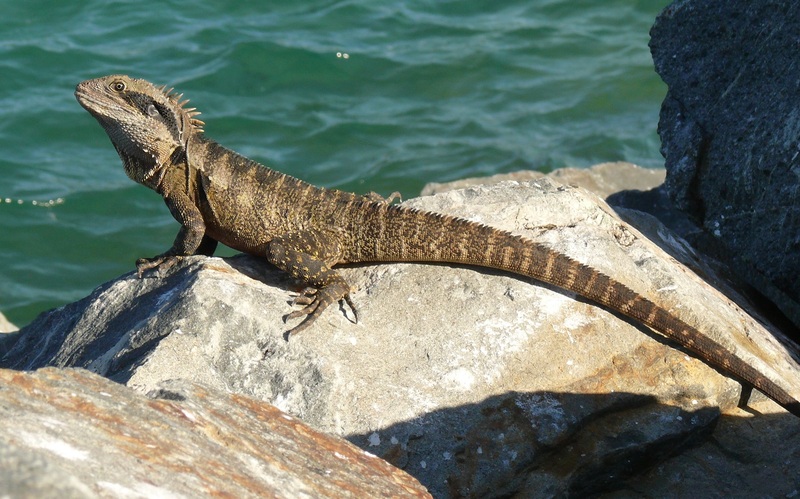 This one was found sunning itself on the rockwall of Cudgen Creek which empties into the sea at Kingscliff Beach. Another un exciting day but I had my final dental appointment in the afternoon. The southerly change from yesterday was evident in the cool winds despite brilliant sunshine. Today we had planned to take grandson Chris to the Planetarium but he did not want to go. Instead Donnis and I decided to have a picnic at Mount Tamborine which is included as part of the Gold Coast. http://en.wikipedia.org/wiki/Tamborine_Mountain Instead of taking the longer but quicker Motorway 1 route we decided to travel inland to Canungra, a shorter trip but passing through more suburbia. Part of the small village of Canungra. 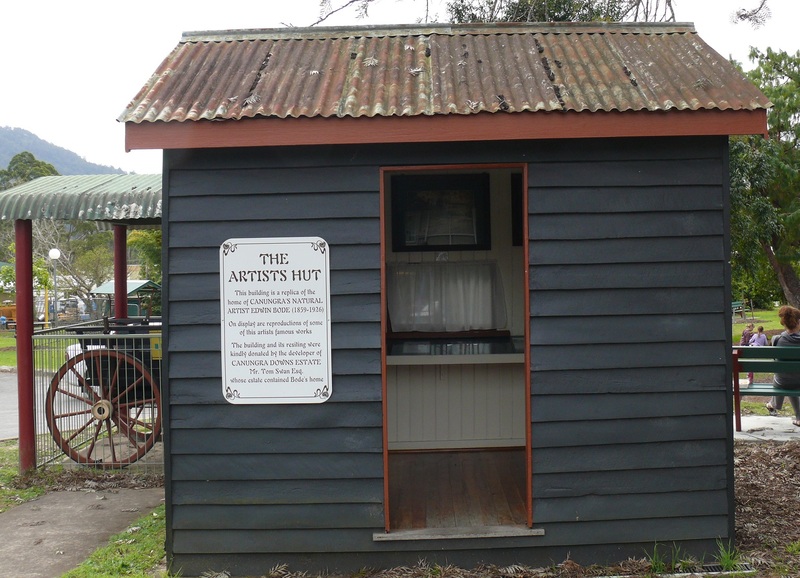 The small hut used by local Canungra painter, Edwin Bode, 1859 – 1926.
http://en.wikipedia.org/wiki/Canungra,_Queensland After a short stop in Canungra we started the steep and winding one lane road to the top. The road has a steep drop to the valley floor and part way up the mountain the road becomes so narrow there are traffic lights so traffic only flows in one direction. There is no way cars could pass on this ever narrowing road. There is simply nowhere to back up and the drop off is a bit frightening. Incidentally the Australian Army has a Jungle Warfare Training facility in the steep rainforest covered hills. Back in the Vietnam war days this training facility was the final training centre before heading overseas. It had a reputation for being a tough course. Once at the summit of Mt Tamborine we could see the Gold Coast spread out far below. House perched atop the steep valley looking over the Gold Coast. View of the Gold Coast from beside the house. There are many walking tracks in the National Park but today we were running out of time and besides, it was a bit chilly. We decided to drive home via the M1 and once at the bottom of the range realised our friend Glenda B lives at Nerang so we took a small detour to drop in for a coffee. 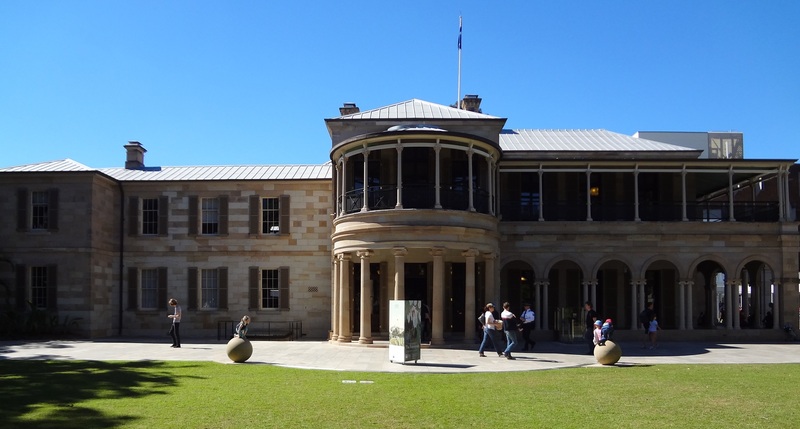 Today I took a bus into the City and walked to the City Gardens, Government House and the Queensland University of Technology. 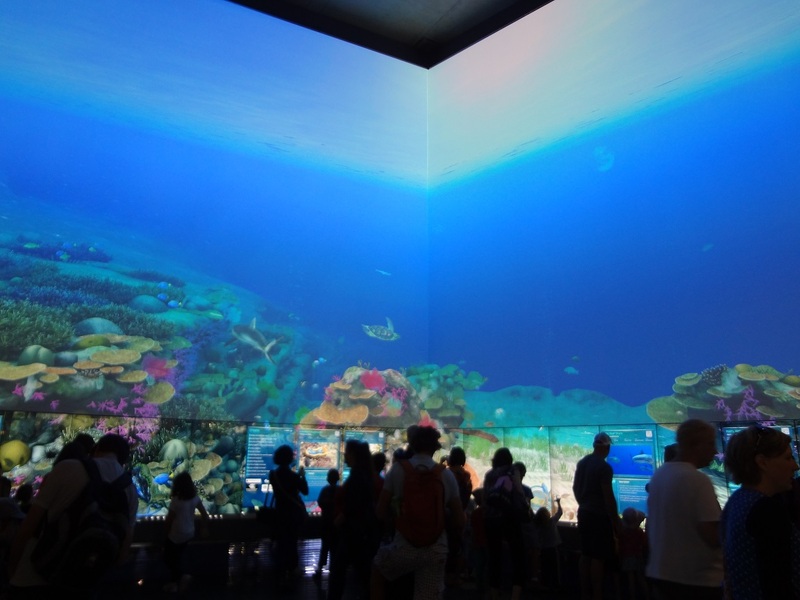 Projected aquarium display at QUT. 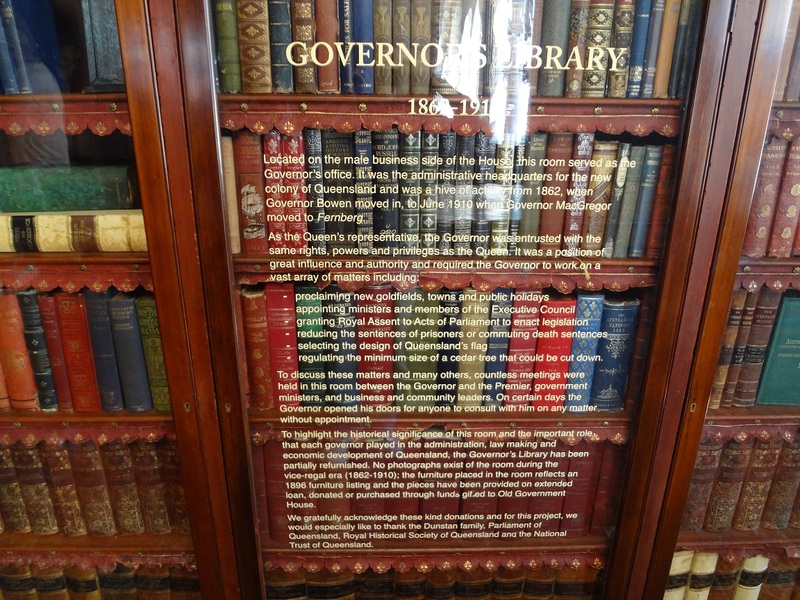 from the ground floor the display looks like one complete viewing panel but is in fact two right angle walls. Today only,was a festival called Robotronica http://www.robotronica.qut.edu.au/demos/ and I was caught in the thick of the crowds of people all wanting to see and touch displays. All the demos, tours, talks and displays were simply booked out or overcrowded. I am sure the organisers were not expecting such overwhelming crowds…neither was I. One display I particularly wanted to see was a heavy duty quadricopter (in fact this version had 6 rotors) but the display was overwhelmed and no flying displays were scheduled. Pity as I have an AR Drone quadricopter and wanted to see how this version performed. I had a little luck here as one lifelike robot was on active display wandering in and around the crowds inside the Governors house, When approached the robot would back up or change direction, never touching a person although many people had to pat the robot.